Orc is a word used to refer to various tough and warlike humanoid mythical creatures in various fantasy settings, particularly in the stories of Middle-earth written by J. R. R. Tolkien and derivative fictions. The word made its appearance earlier in Beowolf (denoting monsters), Giambattista Basile (large talking beasts), and William Blake (a good creature). Ogre and Goblin are sometimes used as synonyms or refer to similar creatures within fiction, however historically the Orc shares little in common with either. Often barbaric and unintelligent, Orcs are usually seen as the most war-mongering and violent of all mythical creatures. Tolkein was a devout Roman Catholic and at the same time a lover of myths. These came together in his assertion that he believed mythology, however misguided at times, to point toward the Truth. Thus, his Orcs can, and should, be interpreted within the context of the symbolism of his writings as a whole. Orcs belong to the side of evil, either brought down to the level of Satan as fallen angels that were cast out of Heaven along with Lucifer, or the devil's soulless creation. For indeed, only God can give life; Satan is but the "pretender" to the throne and can only imitate God's work. Whether Orcs are fallen elves (angels) or abominable creations of the devil, does however make a difference to the Orcs. Fallen angels have a chance for restoration and an eternal life of joy and fulfillment in Heaven. The soulless abominations created directly by the devil have power only through their creator. When the source of evil is vanquished, they return to dust. Orcs are often portrayed as misshapen humanoids with brutal, warmongering, sadistic, yet cowardly tendencies, although some sources portray them as a proud warrior race with a strong sense of honor. They are variously portrayed as physically stronger or weaker than humans, but always high in numbers. They often ride wolves or wargs. 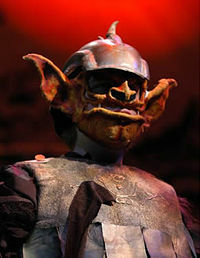 In many role-playing and computer games, though not in J. R. R. Tolkien's works, Orcs have green skin (earning the name "Greenskins" in most games) and have faces that resemble a cross between a pig and a primate. I originally took the word from Old English Orc (Beowulf 112 Orc-neas and the gloss Orc = þyrs ('ogre'), heldeofol ('hell-devil'). This is supposed not to be connected with modern English Orc, ork, a name applied to various sea-beasts of the dolphin order. The word used in translation of Quenya urko, Sindarin orch is Orc. But that is because of the similarity of the ancient English word Orc, "evil spirit or bogey," to the Elvish words. There is possibly no connection between them. The English word is now generally supposed to be derived from Latin Orcus. Tolkien sometimes, particularly in The Hobbit, used the word "goblin" instead of "Orc" to describe the same type of creature. It should be noted that in more classical settings, goblins are hardly seen as human-size and warrior-like, but are rather smaller and more mischievous, like pixies. In more modern traditions, goblins and Orcs have come closer in meaning and are at times interchangeable. Another major author who used Orcs in their writings before Tolkien (not including the use of goblins) was the British poet William Blake. Unlike the medieval sea beast, or Basile's and Tolkien's humanoid monster, Blake's Orc is a positive figure; the embodiment of creative passion and energy, Orc being an anagram of Cor, heart. In J. R. R. Tolkien's writing, Orcs are of human shape, but smaller than Men, ugly, and filthy. In a private letter, Tolkien described them as "squat, broad, flat-nosed, sallow-skinned, with wide mouths and slant eyes". Orcs eat all manner of flesh, including human. Although not dim-witted, they are portrayed as dull and miserable beings, who are only able to destroy, not to create. In some versions of his stories, Tolkien conceived Orcs to be marred Elves, enslaved by Melko (aka Melkor and later Morgoth, Tolkien's personification of Satan), broken and twisted into his evil soldiers. Other versions (including notes made both early and late in Tolkien's life) have Orcs as "parodies" or false-creations of Morgoth's that are animated solely by his evil will (or, perhaps, by his own essence diffused into each), and made intentionally to mock or spite Eru's (also known as Ilúvatar, and who represents God in Tolkein's tales) creations—the elves and men. Yet this is held true by the wise of Eressëa, that all those of the Quendi who came into the hands of Melkor, ere Utumno was broken, were put there in prison, and by slow arts of cruelty were corrupted and enslaved; and thus did Melkor breed the hideous race of the Orcs in envy and mockery of the Elves, of whom they were afterwards the bitterest foes. For the Orcs had life and multiplied after the manner of the Children of Ilúvatar; and naught that had life of its own, nor the semblance of life, could ever Melkor make since his rebellion in the Ainulindalë before the Beginning; so say the wise. And deep in their dark hearts the Orcs loathed the Master whom they served in fear, the maker only of their misery. This it may be was the vilest deed of Melkor, and the most hateful to Ilúvatar. In another account, Melkor captured some Elves before the Valar came to rescue them, and he tortured and perverted them, producing the first Orcs. But other versions of the story (written both before and after the version that appears in The Silmarillion) discount this, and claim that the Orcs are soulless beings animated solely by the will of their evil lord (be it Melkor or, later, Sauron), which explains why they collapse and retreat in battle should the “guiding will” be removed. This latter version falls more in line with the idea of Morgoth’s dispersal into the world he marred, and with the idea that his creations were mere imitations (such as "Orc" = parody of "Elf"); it also provides a moral basis for later inhabitants of Middle-earth, who kill Orcs without compassion or compunction. Other versions state that Morgoth bred the Orcs from Men, whose awakening in such texts is placed soon after the awakening of the Elves. Tolkien also suggested that Men were cross-bred with Orcs under Morgoth's lieutenant, Sauron. The fierce black Orcs known as Uruks were created in this way. The process was later repeated during the War of the Ring by Saruman, enabling him to create the "fighting" Uruk-Hai, in Tolkien's second installment of the Lord of the Rings trilogy, The Two Towers. In the late twentieth century new interest in the works of Tolkien coincided with the beginnings of a fantasy sub-culture that included literature, films, television shows, role-playing, and video games. Tolkien's impact on this movement can be seen in how much is borrowed from his tales of "Middle-earth," particularly the idea of Orcs. In the popular role-playing game, Dungeons & Dragons, a major character, Warhammer, is identifiable as an Orc. Orcs also feature prominently in the Magic: The Gathering and Warcraft role-playing games. 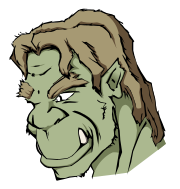 In many of the fantasy oriented books and graphic novels of the late twentieth and early twenty-first centuries, Orcs have become almost stock characters, easily recognizable as evil and war-mongering. ↑ Ralph C. Wood, Biography of J. R. R. Tolkien. Retrieved August 2, 2007. ↑ The Letters of J.R.R. Tolkien, #144, 25 April 1954. ↑ Nomenclature of The Lord of the Rings. ↑ The War of the Jewels, p. 391. ↑ The Letters of J.R.R. Tolkien (Houghton Mifflin 1981), p. 274. Tolkien, J.R.R. (1994) in Christopher Tolkien (ed. ): The War of the Jewels. Boston & New York: Houghton Mifflin. ISBN 0-395-71041-3. This page was last modified on 10 May 2009, at 18:40.